What If Samsung Stopped Supplying Parts For the iPhone 4? This is all hypothetical, but what would happen to the iPhone 4 if Apple's vigorous legal campaign against Samsung caused an irreparable rift between the two companies? Several key components of the iPhone 4 including the Flash Memory, DRAM memory and applications processor come from Samsung. 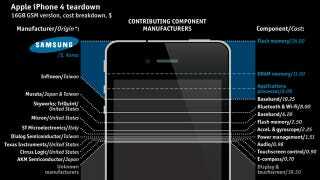 Together, these account for $45.68 in parts which is 26% of the final component cost of the iPhone 4. If Samsung were to turn its back on Apple, who would supply these components, how much would they cost and how quickly could another company supply them? We don't often think about it, but Samsung supplies these critical components to Apple at a reasonable price and it supplies them at a volume few companies could match. Remember, Apple shipped 20 million iPhones last quarter which is a lot of processors and flash modules in a relatively short amount of time.